Part parody and part homage to guitar music, Dutch four-piece Mozes and the Firstborn have set a new tone with their American-tinged third album Dadcore. The album's name comes from guitar music apparently becoming the preserve of dads, and no longer being popular with teenagers. How true that is is a matter of opinion, but in any case the album expertly crashes through a kaleidoscope of guitar songs, at times reminiscent of 90s grunge and early-00s power pop. 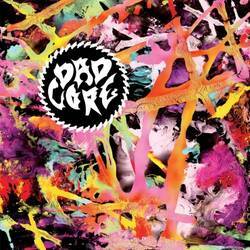 Dadcore is promoted as a modern day mixtape of nostalgia-evoking guitar music and, perhaps somewhat unusually, the band have a staggering proficiency for delivering the majority of the album's songs with aplomb, and capturing fresh hooks that still sound comfortably familiar. It's an homage but without imitation. Opener "Dadcore" sets off the direction of the album, fizzing with twee hand claps and catchy refrains, and sounding like it would fit comfortably alongside every mainstream American pop rock band that flooded the airwaves in the early to mid 00s. The band then easily switches into a sound that's indebted to 90s grunge, with "If I" beginning with a blaze of distorted electric guitars and muscular drumming. Dadcore whirrs through a collection of songs that sound both familiar and new, but skilfully avoids sounding like a tribute album. The songs are still the band's own, like the brutalising but enrapturing force of "Scotch Tape/Stick With Me", which features an arresting spoken word interval performed by LA-based musician Kelsey Reckling, backed by a slowly building bassline that skulks in the background like an animal stalking its prey. Reckling recounts an intense piece about fighting back against a boyfriend who leaves suddenly and drives off into the night, that then launches into the band's pleading and rough-around-the-edges track "Stick With Me". Mozes and the Firstborn twist between earnest tracks and clever takes on music from the eras that influenced the sound of Dadcore. This is most overt on the irrepressibly catchy strains of "Sad Supermarket Song", a satirical take on over-emoting in songs, that takes place as the protagonist wanders forlornly through a supermarket. Lyrics like "Traumatically, I greet a child" and a chorus that's preempted by shouts of "chorus now" shouldn't lift, but somehow do. If you passively listened to this song you could easily think it was an emotional track. It highlights how the by-numbers way of songwriting can dilute songs into sounding deeper than they actually are. It's a trick that Weezer would be proud of. The album is a versatile mix of nostalgic guitar songs that successfully and humorously carries Mozes and the Firstborn's desire to create an album that's evocative of a mixtape. Sometimes there is a propensity for filler on the album, like on the brief instrumental interval of "Fly Out I" or the meandering nature of "Hello". But has there ever been a mixtape where the listener has liked every single track on it? If not, Dadcore is perhaps the closest you'll get to one. Posted Jan. 21, 2019, 9:57 p.m.